UC combines multiple communication and collaboration tools such as email, voice, instant messaging, conferencing, unified messaging, team collaboration that is accessible using a variety of devices such as mobile device, iPad, laptop, notebook & desktop. 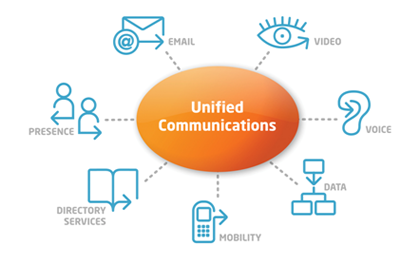 UC can help you accomplish more than any one solution alone ever could and collaboration capabilities into a seamless business environment, maximize IT resource but reduce operation cost. Voice over IP - Two or above parties can make a phone call to each other using internal extension without any charges. Fast, Cost Saving, collaboration and convenience way to communicate with your colleague whatever he/she is working at. Video Conference - Video conferencing can be used to achieve significant benefits beyond increased productivity and reduced costs. Engage in face-to-face interactions with customers, partners, and colleagues in video conference without any travel.